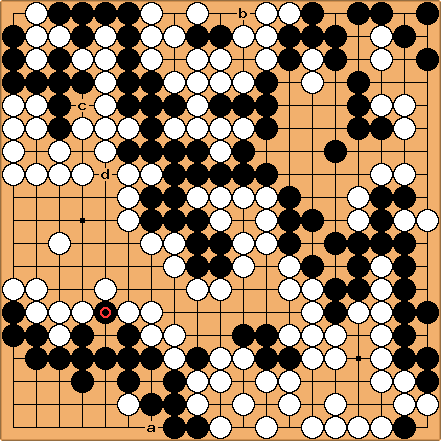 [Liu Xing] ([White]) versus [Gu Li]. If you are learning the rules, start at the scoring page for an overview on the different ways in which the score of the game can be determined. This page contains some finer points and comparisons of Territory scoring and Area Scoring. It assumes that you've read the Scoring page. See Mathematics of Scoring for a not-too-hard to follow algebraic treatment of how the results can differ under different scoring systems. The two scoring systems are equivalent under certain assumptions and practically equivalent in games but for a few exceptions where only the ultimate plays of the game can be affected. The assumptions are: no handicap, no "seki with eyes" positions and no plays after passes. See below for more detail, and either the Mathematics of Scoring or logical proof of the equivalence of territory and area scoring for the math. Playing in your own territory reduces your score. (it puts a stone of your color on the board). Playing in your own territory doesn't affect your score. This may seem like a big difference: Area Scoring lets you reinforce your own territory at no disadvantage, while under Territory Scoring you'd be penalized a point. However, this isn't true unless you do it after all Dame points are filled in. Why? Because if there are dame (or real) points left on the board, a play in your own territory (which gets you zero points), lets your opponent play one of the dame (which gets them one point). Do this ten times and your opponent has ten more points than you. A small advantage of Area Scoring is that you don't have to keep track of prisoners. When removed from the board, prisoners can simply be returned to the bowls. However, this can obscure positional judgment, which is generally accepted to be more quickly done counting territories and prisoners. Territory scoring is generally more fine grained than area scoring. Territory scores differ by one point, while area scores normally differ by two points. (On a 19x19 board, if there is no seki the difference between Black's score and White's score will be odd.) In practice that means that in most endgames errors that would result in a loss of one point by territory scoring may not affect the area result. In that sense territory scoring is sharper than area scoring. Suppose that, on the board aside from the points, Black is ahead by one point by both territory and area scoring, and this is the last contested area. takes away a potential point of territory for White, to win by one point by either form of scoring. - are dame. is a dame, allowing White to make a point of territory with . By territory scoring the result is jigo instead of a Black win. By area scoring, however, Black still wins because he gets the last dame with . is smaller than under both forms of scoring, but because area scoring is normally more coarse-grained than territory scoring, it allows Black to be sloppy with . Territory play is sharper. Anon Is the above result a peculiarity of considering a board with an even number of intersections? After all, in area scoring who takes that last dame makes a difference of 2 points on an 'odd' board, but only 1 point on an 'even' (eg 4x4) board. gnostic? : This has absolutely nothing to do with granularity. In area scoring, on an odd sized board, black has a natural one point advantage, owing to the fact that he plays the first and last dame. Granularity would imply that the two scoring systems have differences in the values of certain plays, which is not the case except when sekis with eyes occur, in which case area scoring (correctly in my opinion) grants more points locally to the player who was able to extend farther inside the seki. In either scoring system destroying an eye is worth more than taking a dame. If these examples show a lack of granularity in area scoring, that would imply that both area and territory scoring have reduced granularity when komi is used, which is nonsensical. Black is not guaranteed to get both the first and the last dame. That aside, granularity has to do with the fact that a dame is worth 1 point by area scoring and 0 points by territory scoring, and with the fact that, except in cases so rare than none have been reported in an actual game, there are no smaller plays than dame. Thus, area scoring has a large drop in the value of plays from 1 to 0, which territory scoring does not have. Often the smallest play by territory scoring is 1/3 point in the final ko. Komi has nothing to do with granularity. Which seems to show area, rather than territory scoring giving the better result each time. See DameKoThreats for an example of where a scoring system that takes into account who played last, gives a more complex game than one that doesn't. Button go is a form of area scoring that is as sharp as territory scoring. See here for further discussion on granularity. The main strategic difference between Chinese-style (area) and Japanese-style (territory) scoring has to do with counting eyes in seki. When there is a choice of plays one or some of which lead to such a seki vs. one or some that do not, correct play may differ between scoring styles if one player scores more points in the seki by Chinese-style scoring than by Japanese-style scoring. (It is deliberately not stated "area vs. territory" because there are territory scoring rules that do count eyes in seki.) However, such instances are rare. Sekis with eyes are positions like this Gun Six position: Under Chinese-style scoring the marked space is a point for white. Under Japanese rules it is not, although there are other types of territory scoring (like on some go servers) where it is. In a handicap game, Black is better by one point per handicap stone (except the first) under Area Scoring than under Territory Scoring. As noted on the Chinese Counting, half the handicap is added to White's score, and also subtracted from Black's (which keeps the sum of the score the number of points less seki). MtnViewMark: I was not able to find a reference to handling handicap in the translation of the the Chinese Rules, or on the Chinese Scoring page. I'm hoping someone can provide more certainty about how they handle handicaps. AGA Rules: The end of Section 4 ("Handicap" section) of the complete text of the AGA rules states: "If the players have agreed to use area counting to score the game (Rule 12), White receives an additional point of compensation for each Black handicap stone after the first." This has the effect of altering the area score to be the same as the territory score. Ing Rules: No adjustment is made. MtnViewMark: I also didn't find any reference to handling handicap stones in the Japanese Rules or Korean Rules, though I believe that no rules that use Territory Scoring adjust for the handicap, other than to set the komi to 0.5. For strategy, the difference only matters during the very last stage of the game. Under territory scoring one can pass rather than play a dame. Under area scoring one should always fill up the dame, because they are worth points. Reversely, under area scoring playing inside one's own or the opponent's territory instead of passing does not matter, under territory scoring it costs a point. Thus, under area scoring once all dame have been filled, you can defend a weak spot without checking whether it is really necessary to do so. An example where territory scoring and area scoring differs is when there is one last half-point ko to be connected and one player is komonster, who can not only win the ko but also delay winning it until after all the dame have been filled. Winning the ko then becomes the last play. In this diagram, with no stones captured and Black to play, under territory scoring, Black has little choice but to connect at a, and lose by one point. Under area scoring connecting at a will also create a loss by one point, but now Black has a better way to play. Under area scoring Black should play the last neutral point at b. White can then capture at a, but Black has a ko-threat at c. After White responds to c, and Black retakes the ko, White does not have a ko-threat and will have to pass (or make some inconsequential move). Then Black can connect at a to win by one point. The following game is taken from the first round of the 9th Xinren Wang tournament in China, the players are Gu Li 5p (taking Black) and Liu Xing 6p. This tournament uses area scoring. Liu Xing (White) versus Gu Li. Black had just taken the half-point ko at . This is a game where the margin is at half a point, so whoever wins this ko wins the game. White has a ko-threat at a, but Black also has a ko-threat at b. A White atari at c will only induce a ko-threat for Black at d. Unable to find any other ko-threats, and seeing an area difference of 1 1/2 points in Black's favor, White resigned at this point. It was later pointed out that because area scoring is used, White can win by playing this way. Although the atari at loses one point, it is a good move which can turn the tables. It allows White to win the ko on the last move, and that is enough to win the game. By winning the ko, White occupies two points at and , compared to Black's occupying those two points. The swing between winning and losing the ko is thus 4 points of area. sacrifices 1 point to gain 4, for a net gain of 3 points. But Black also gains 1 point with . The net gain with compared with the threat at is thus 2 points. White wins by half a point under area scoring rules by playing this way. Under territory scoring rules, this sequence would have made no difference to the scoring at all, because White gains the stone at the expense of sacrificing the stone, so the net gain is zero compared to simply allowing Black to connect the ko. Territory scoring doesn't make it necessarily difficult to decide on life and death issues. There are territory rules that allow disputes to be settled by play, such as the Lasker-Maas rules and Spight rules. It is a false belief that Area scoring requires a lot more counting than Territory scoring. 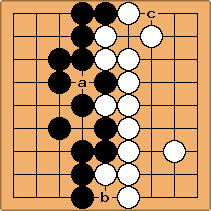 In practice, at the end of the game, e.g., Chinese Counting can be used, and only Black's stones need to be counted. The ability of the komonster for the final ko to delay winning the ko until the opponent must pass, while it may make for a larger score difference than 1 point between the different scoring styles, rarely affects strategy. The difference would come before the ko fight. There is a form of territory scoring, Sunjang Baduk scoring, which does not have these differences with area scoring. With Sunjang Baduk scoring playing a dame may gain a point, and playing inside your own territory does not cost anything. Sunjang Baduk scoring often leads to different results than either territory or Japanese/Korean style territory scoring.